Have you wanted to Sew Cloth diapers but didn't know where to start? This book is for you! Easy instructions and photos will guide you through the steps to make your own diapers! Make a basic diaper cover or one of the many diaper design variations including Pocket Diapers, Quick-Dry AIO's (All-in-One), Sham Pocket Diapers, Fitted Prefold Diapers, Hybrid Snail Shell Diapers, and more! Also covered in this book are many sewing tips, techniques and creative ideas using FOE (fold over elastic) or just a simple Turned and Top-stitched technique. Softcover - 60 color pages with photos of each project and very detailed instructions. 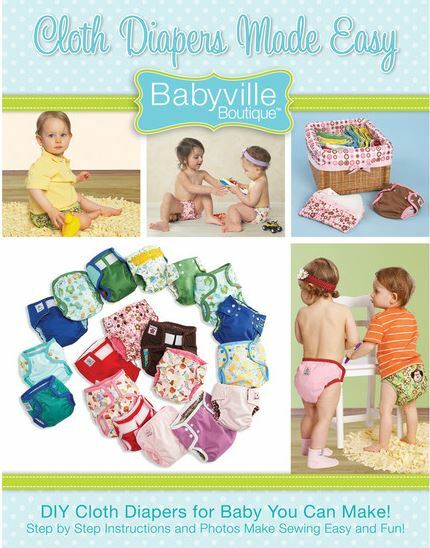 Includes patterns for 4 sizes of diapers and covers, fitting babies 6 lbs to 40 lbs! "This pattern is intended for home use. You may sew items for resale without licensing, but it is your responsibility to be sure you are not infringing onother commercial patents or copyrights. This pattern is presented in good faith, however, since we have no control over the actual construction of the project, no warranty is made or inferred regarding fit corresponding to size or weight measurements provided, or for the performance of the project. As baby body builds differ greatly, you may need to adjust this pattern for a proper fit for your baby. Please refer to alteration and fitting techniques as a guide for "tweaking" fit, if needed."